As Lancaster’s first winter storm of the season began on the morning of Nov. 15, a panel of Franklin & Marshall faculty members analyzed a different type of storm – the one enveloping the American political landscape with polarization, gridlock and heated rhetoric. 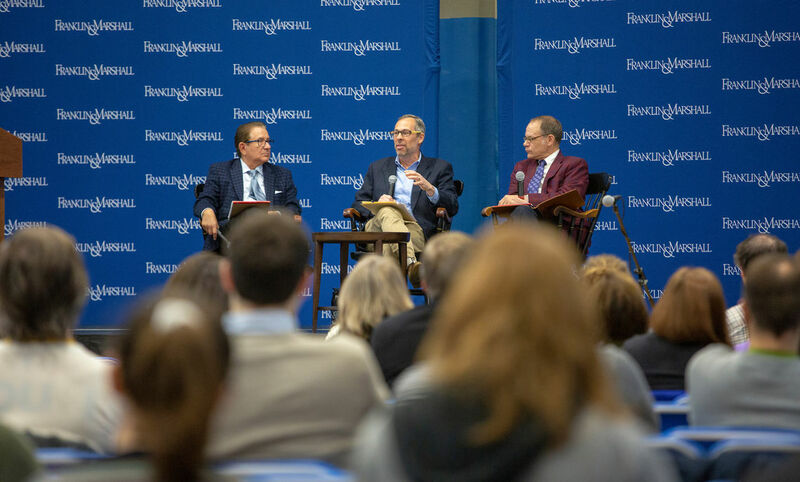 F&M’s Terry Madonna, Stephen Medvic and Matt Schousen examined the fallout from the Nov. 6 midterm election for an audience in Mayser Gymnasium during Common Hour, the weekly community discussion conducted every Thursday classes are in session. The government professors broke down the results of the election, particularly the 33-seat Democratic gain in the House of Representatives, with an eye on what it means for future legislation and the presidency of Donald Trump. More than 115 million people voted in the election – or 48.9 percent of those who were eligible – for the highest turnout in a midterm since 1914. For the first time, more than 100 women are members of the U.S. House, as more women ran for seats in Congress and state legislatures than in any other American election. Madonna reported that Nevada made history by electing 22 women to the state assembly, the first female majority of any state in the country. The results were largely what pundits expected, said Medvic, F&M’s Honorable and Mrs. John C. Kunkel Professor of Government. He believes Trump’s low approval rating hurt Republican candidates across the country. Schousen prepared the audience for what will likely happen over the next two years: continued polarization, legislative gridlock, and investigations of Trump. There’s a backlog of things Democrats want to investigate, Schousen said, from Trump’s possible ties to Russia to cabinet officials’ travel funds to policies such as the Muslim travel ban. Incoming chairs of committees have already requested information from the attorney general’s office, indicating they will begin investigations in January. “And Trump has vowed a ‘warlike’ response to those investigations,” Schousen said. So, is there any hope of the two sides working together? Schousen believes the president can find common ground with Democrats on infrastructure, DACA “Dreamers,” tax relief for the middle class, and prescription drug coverage, among other issues. Both sides have an incentive to build a record of accomplishment to improve their chances of re-election in 2020, he said.